Down the road, I see a street sign. "Daybreak Drive," it reads. I smile at the message; inadvertent though it may be, the name is very telling. This is daybreak for me. This is the beginning of the rest of my life - and I'm going to enjoy it. For such a prestigious festival, it may be overwhelming to some owners who are wondering how to dress their Acara, but fear not, for I have created a lovely wardrobe guide! With so many options, there are so many different ways to dress, but hopefully this guide will point you in the right direction, depending on the unique personality of your own Acara! With Acara day upon us, owners everywhere are scratching their heads trying to think of the perfect gift to give their beloved pet. Some owners may go with a tasty sweet, such as a festive dark chocolate Acara. However, these gifts don’t last very long. Toys break. Candy is eaten. Fear not! 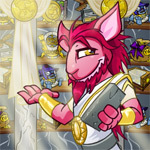 I have the perfect solution: a petpet! Now, it is a bit intimidating to face the massive amount of wearables currently available to try to find the best edible outfits for your pet to put on, so I've done a lot of research myself to bring you this list. This features various types of wearables, all with food being the star of the piece, that you can give to your pet. This can act as a jumping off point for you, maybe you'll find one item that inspires a whole outfit, or you'll attach all of these to your Neopet for the ultimate food buffet!! Whatever the choice, as long as it involves food it is a good choice. Kiko's Kamp for Kids only ran in week-long sessions, but most of these kids were return visitors. Many of them had been here for a month straight. There were really only two types of campers at Kiko's Kamp: the kids that misbehaved so much at home that their parents paid for them to go to camp just to get a break from them, and the kids that were sent here because their parents thought they were socially awkward and needed to make new friends. Stellaluna ("Stella") the Blue Ogrin was the second kind of camper. As she tried to move closer to the campfire, she tripped over a log and collapsed to the ground, all four of her legs tangling up together. She quickly pulled herself to an upright position. The other campers might've laughed at this, if not for the fact that they had seen Stella trip countless times over the past three months. "So, what's the story tonight, Mr. Garic?" She peered at the old Gnorbu through her thick glasses. They had become lopsided as a result of her fall, and she took a moment to straighten them out. Garic always felt like Stella could see right through to his very core whenever they made eye contact. Her spectacles made her eyes look four times their normal size. It was a little creepy. No wonder she had no friends... "Mr. Garic?" Her tiny voice startled him from his thoughts. He cleared his throat. "Tonight, we hear the tale of T-D-M-B-G-P-O-P!" "What?" "Huh?" "The who?" "I said, Tee-Dee-Em-Bee-Gee-Pop! The Discarded Magical Blue Grundo Plushie of Prosperity." "Oooooooooohhhh." I am on the move. I left Neopia Central this morning around daybreak, heading south. I don't have a particular destination. I just want to get away for a while, to get some time to myself. Life in Neopia Central is hard. There are so many people, so much more than I'm used to. I grew up on a small farm on the outskirts of Meridell, with no neighbors in sight. I lived there with my father and my sister, until my sister moved to Brightvale for school. We seldom had visitors, and my dad usually made the trips into town without us kids, bringing back for us all the groceries and whatnot. I got used to not being around people. I moved out to the city when I came of age; it was time to leave the farm and get out into the real world. I didn't realize how much the real world entailed, I wasn't ready for all of this. There's so much hustle and bustle. There's so much life - we didn't have that out at the farm. I guess you could say I experienced some growing pains. I've been here for a year already, and I still don't have a handle on things. I speak to my neighbors once in a while, when I see them out and about. For all my efforts, I haven't made any friends. I work at a convenience store, where customers are typically friendly and we all get along, but outside of work things are completely different. I'm hardly acknowledged by anyone when I'm out and about. I'm surviving - but I'm not living­. So you’ve upgraded your Neopets account to Neopets Premium. Now what? "And you're sure about this?” Corbin asked for the fifth time. “For the last time, I'm positive about this,” I informed. Bad puns? Hissies? What's not to love?